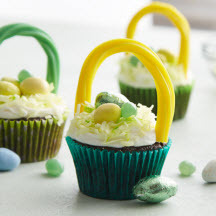 These adorable Easter basket cupcakes are frosted and then topped with nests of coconut, candy eggs and licorice handles. Preheat oven to 350°F (175°C). Line muffin cups (2 1/2 inches in diameter) with paper bake cups. Stir together sugar, flour, cocoa, baking powder, baking soda and salt in large bowl. Add eggs, milk, oil and vanilla; beat on medium speed of electric mixer 2 minutes. Stir in boiling water (batter will be thin). Fill muffin cups 2/3 full with batter. Bake 22 to 25 minutes or until wooden pick inserted in center comes out clean. Cool completely. To make Easter baskets, frost each cupcake with vanilla frosting. Immediately make "nest" on top of each cupcake with tinted coconut; place assorted candy in nests. For handle, insert wooden pick in each end of Twizzlers twists; press down into each side of each cupcake, bending to form handle. *To tint coconut, combine several drops green food color with 3/4 teaspoon water; add to 1 1/2 cups coconut. Stir until evenly tinted. Repeat using blue, pink or yellow food color. Note: Adults should supervise children when preparing this recipe. Remove wooden picks before serving.